Pinot Gris is a light, bright and uncomplicated wine that's refreshing and easygoing. It's the perfect wine for a Spring garden dinner party. And that's just the way Kendall-Jackson chose to introduce their new Vintner's Reserve Pinot Gris recently. Kendall-Jackson has always impressed me as a winery that puts their money where their mouth is when it comes to claiming "food friendly wine." 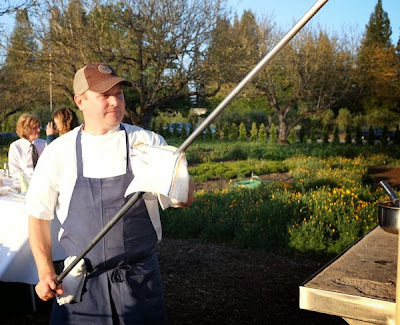 They have a restaurant in Healdsburg called Partake by KJ and host a whole variety of food and wine pairing tasting experiences at their estate which has a vast organic garden including a sensory garden to help demystify food and wine pairing and explain the flavors in wine. Culinary gardener Tucker Taylor showed us around, explaining his gardening techniques and pointing out some very interesting varietals including celtuce, a cross between celery and lettuce and spigarello, a leafy green with tender curly shoots. The garden produces enough for not just the winery but for local restaurants. 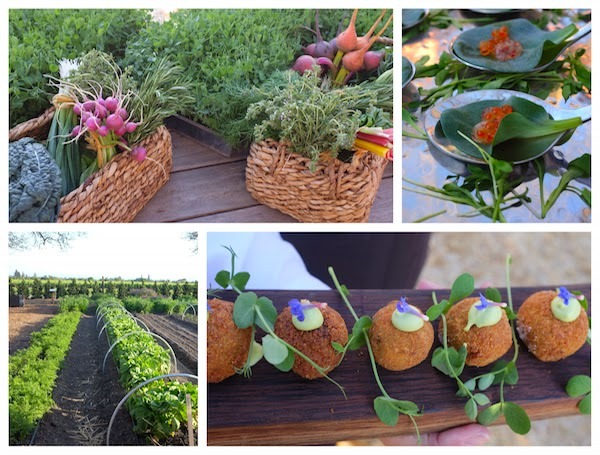 As we walked around the property we nibbled on oyster leaf topped with salmon roe and arancini both paired well with the Pinot Gris, which is a good option as an aperitif. Kendall Jackson Vintner's Reserve Pinot Gris is an intriguing blend of Pinot Gris along with Roussanne, Grüner Veltliner, Chardonnay, Viognier and Albariño. 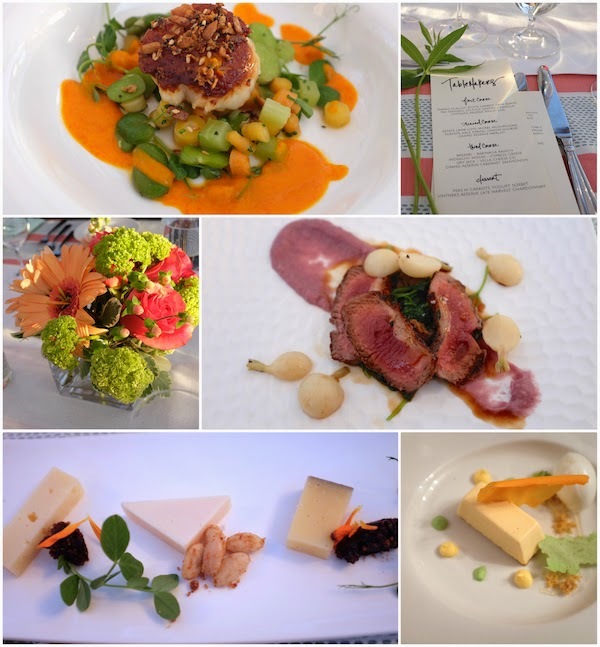 The grapes all come from California, and in general cool climate coastal regions. Pinot Gris is the same grape varietal as Pinot Grigio but it tends to indicate a richer and more luscious textured wine. This wine in particular is bright and fresh with lots of juicy acidity and fruit--in particular peach, melon and mango. It's also a great value at just $15 a bottle. It's a versatile wine too, pairing well not just with appetizer but with our starting course of a buttery seared scallop with a succotash of fava beans, carrots, celtuce and pea greens. It would also pair well with cheese, charcuterie, egg dishes or pretty much anything you'd serve at a picnic like ham sandwiches, cold fried chicken and a variety of salads. Lamb loin with morels, turnips, kale and spring onion soubise was paired with their Grand Merlot, a selection of cheese was paired with Grand Reserve Cabernet Sauvignon and the playful "peas and carrots" dessert with yogurt sorbet paired with Vintner's Reserve Late Harvest Chardonnay. 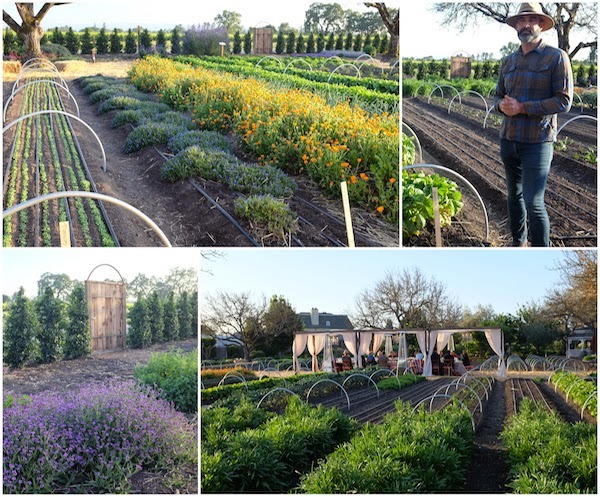 My thanks to Tucker Taylor for the tour of the garden, winemaker Randy Ullom for sharing the story of the wine, Lauren Kelp for designing a beautiful tables cape, executive chef Justin Wangler for the wonderful menu and Kendall-Jackson for hosting a truly lovely evening. Disclaimer: I was a guest, but I was not monetarily compensated to write this or any other post on Cooking with Amy.